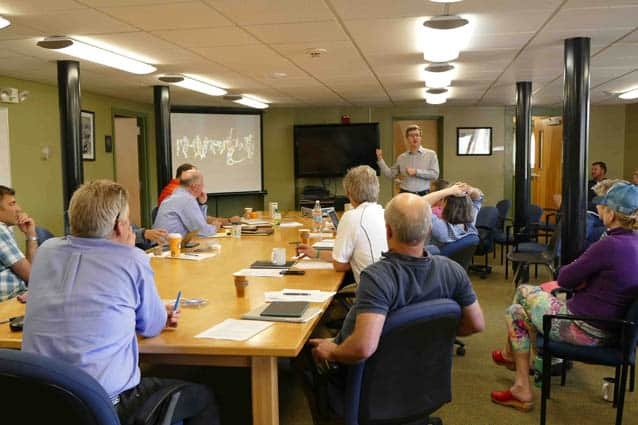 Killington Mountain School’s board of trustees met on May 20 for an academic symposium at the school. KILLINGTON—The question is a daunting one: how can a school, tasked with preparing its students to succeed in a rapidly-evolving future landscape, arm graduates with the skills needed for jobs that don’t even exist yet? That question, along with a discussion about the changing landscape of 21st century education and society was given an in-depth exploration on May 20 at an academic symposium held in concert with Killington Mountain School’s board of trustees meeting. Keynote speakers challenged the audience, comprised of KMS teachers, coaches, staff, parents, and trustees, to rethink what teachers are teaching and how they are teaching it. Speakers at the meeting included Charles Fadel, Lou Piconi, and Alice Preisler. All three speakers brought a unique perspective on the future of education and offered invaluable insight on how to best prepare today’s youth for what is to come. Fadel is a global education thought leader and expert, author, and inventor. He is the founder and chairman of the Boston’s Center for Curriculum Redesign and also chairman of the Fondation Helvetica Educatio (Geneva, Switzerland). In addition, he is a visiting scholar at the Harvard Graduate School of Education, the MIT Graduate School of Education and UPenn. He has worked with a wide variety of education ministries and organizations, and has contributed to major education projects in more than thirty countries. Piconi is founder and executive vice president of Strategic Activities for the Think Through Math (TTM), an online platform that offers personalized, interactive math instruction for students across the country. His work focuses on the implementation of statewide TTM programs and on creating the company’s long-term vision. Finally, Preisler, a senior project manager in the Risk Control Services Division at AIG, is an expert at high-level data analysis. She has been working with KMS coaches and staff on data tracking and analysis with the aim of enhancing athlete performance and cultivating individualized, targeted coaching. Fadel, Piconi, and Preisler gave presentations to the packed room, after which the entire group split into three breakout sessions to begin envisioning how aspects of what each speaker covered could be implemented in the school’s academic, athletic, and student life offerings. The thought-provoking day led to discussion after discussion, conversations that lasted well into the evening and carried over into the days following the meeting. Teachers, coaches, staff, and parents alike shared ideas about how KMS can implement curriculum changes in order to best arm graduates with skills for a rapidly-changing future, noting that at the same time, the school is already doing a great deal of what the educational experts are suggesting. One might pose the question, just what interested high-level, world-class thinkers like Fadel, Piconi and Preisler to come speak at a small, independent Vermont school? All three have a shared vision of the exciting possibility that exists for the future of KMS. Fadel himself noted that the school’s small size, individualized programming, open-mindedness among its administration and faculty when it comes to adapting for the future, and its population of highly-focused, driven student-athletes who possess grit and passion, are all attributes that make the school both nimble and perfectly suited to be on the forefront of cultivating preparedness for the ever-evolving 21st century among its graduates. The future is clearly bright, and with an active eye toward how to prepare student-athletes for life beyond high school and college, it becomes increasingly clear that KMS really does take you places.